The new 35XP is the low-cost solution in performance, auto-ranging DMMs. 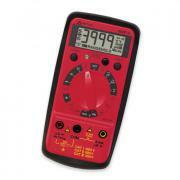 This meter is encased in a small, popular XL size package and offer excellent 0.5% accuracy. Its higher resolution, large character, 4000-count digital and 32-segment analog bargraph display assures maximum readability. Meters include measuring functions for DC and AC Voltage, DC and AC current, resistance from 400 ohms to 40 Mohms, diode test, continuity test and temperature range from -20°C to 1000°C (-4°F to 1832°F). The 35XP also has capacitance measuring capability and features fully-fused current input jacks, incorrect input warning, 10 minute auto-off and data hold button. Included: Safety test leads, Type K thermocoupler probe, temperature adapter, battery, operator's manual, extra fuse and Magna-Grip holster. This 6.5-ounce meter measures 6" x 2.75" x 1.3" and comes with a one-year warranty.